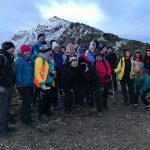 Snowdonia Challenge is a unique 100km walking challenge. 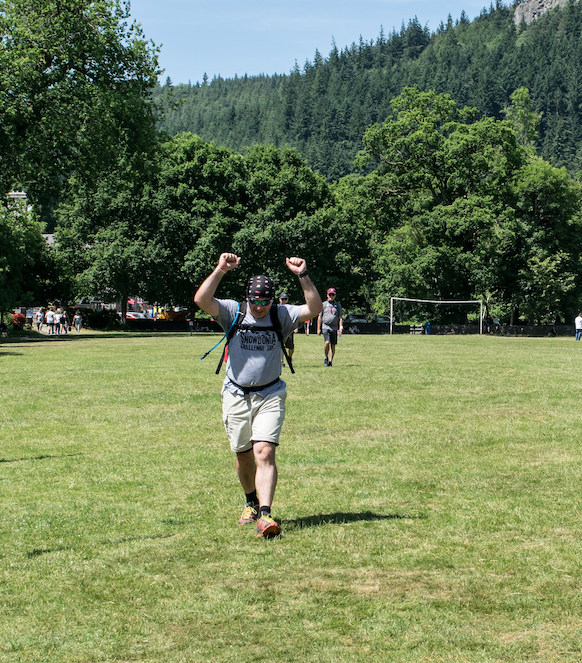 The 3 day event based in Betws-y-Coed is the only one of its kind in the UK. Inspired by Nijmegen Marches, a historic event with a military background it’s great to have a military charity such as ABF The Soldiers’ Charity as part of Snowdonia Challenge right from when it started in 2017. ‘Are you ready for the journey?’ is the strapline we use for Snowdonia Challenge, because we know from personal experience the emotional, physical and mental journey you go through during a challenge like this one. 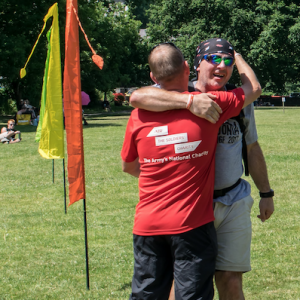 We’ve seen hundreds of personal journey’s over the last 2 years and Dave’s was one that really showed us what this event can mean to people that take part. I joined the ABF The Soldiers’ Charity team the first year as I know Stewart that works for the charity and he persuaded me to take part. I’d left the army 17 years earlier so thought the charity would be a good one for me to support. I thought the challenge looked fun and didn’t see any issues as in my head I was still a fit squaddie! What appealed to you about Snowdonia Challenge the first year? It never occurred to me that Snowdonia Challenge wouldn’t just be a nice easy 3 days. Day one of the first year was great, I didn’t think I had any trouble with fitness and felt really strong, but at the end of day one my legs siezed up and I was in agony. I started and finished day two but to be honest I was in bits. I probably shouldn’t have started day three but I didn’t want to give up easily. I got round the golf course and when I passed the start point I thought about the hill that was coming up and just couldn’t carry on. I was in bits… totally destroyed… heartbroken. I went back to the vagabond to get my stuff and cried my eyes out. I made a promise to myself then that I would come back and finish it. So what training did you do for 2018? Over the next year I lost 3 stone. My wife, Jo, was doing Slimming World and eating clean meals so the fact that we could do this together really motivated me and gave me the energy I needed for training. I was also really motivated to train hard so did plenty of walking and making sure that I did at least one hill a week. I started running 3 times a week and after a few months I’d be running 15 – 20 miles a week and getting up to 10 miles in one run. I also tried to fit in 1 cycle ride every week.When it came to Snowdonia Challenge 2018 I was feeling really positive and managed to get rid of any negative feelings about starting and not finishing the year before. It was brilliant to catch up with friends I’d met in 2017, especially Mike and Andy; and I made a load more too. Being part of the ABF The Soldiers Charity team and the support we get is great. I walked a lot on my own but some of it with Mike and Andy. When it came to the last 5 or 10km on the last day I just put my head down and went for it. Congratulatory hugs at the end! It was great being part of a team again and getting that kind of camaraderie back. Although I didn’t know any of the others when I got there it felt just like being back in the army. It was great to have the whole team together from the Thursday evening, staying in the Vagabond. I found it really therapeutic and made some new friends for life. Day three was my favourite day. Partly because the views are fantastic but also because I’d missed it the first year. What was your favourite part of Snowdonia Challenge 2018? Then, obviously, the fantastic sense of acheivement! on finishing it. I gave me a real sense of pride in myself. What advice would you give to others taking part in Snowdonia Challenge? When it comes to fitness it’s great to have a challenge like this to work towards to keep you motivated. Jo and I also agreed how important it is to have something for yourself, a goal or a dream that’s your own and you can focus on. Taking that time for yourself is great for you and also for those around you. Find out more about being part of the ABF The Soldiers Charity team for Snowdonia Challenge 2019 here.